Wits students residing in private student accommodation on Queens Road, Parktown are calling for Wits bus services to have a drop-off and pick-up point near their residences out of fear for their safety following recent muggings in the area. 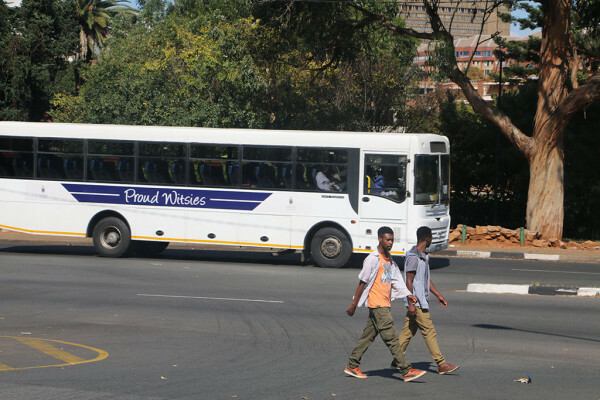 Wits students who live at Park Mews and Student Digz in Parktown are calling for Wits buses to have a drop-off and pick-up point on Queens Road in the interests of their safety following a series of recent muggings of students walking to and from Education Campus and the Junction Residence bus stop. Students and members of the Parktown community say they are being targeted by vagrants who live in Pieter Roos Park. A Wits student who refused to be named is one of the victims of the recent muggings on her way to the Education Campus. “I was walking and I passed by two males, I was speaking on the phone and one of them followed me, he grabbed the phone and disappeared into the park, I screamed for help but he had already ran away,” she recalled. Last week a woman was mugged during the day opposite the park, and the perpetrator was captured through mob justice. Fourth year Education student, Brenda Nyembe, says last year a petition calling for a bus stop on Queens Road, garnered 100 signatures, mostly from Park Mews residents. She says nothing happened after it was handed over to Wits management. The director of Campus Housing and Residence Life, Rob Sharman, told Wits Vuvuzela that he was not aware of the petition. Park Mews manager, Barry Amler, says that they had approached Sharman last year, however, they were told that it would not be plausible for Wits buses to have a bus stop for students who live in private accommodation. “The biggest problem is the park along Queens Road. Perpetrators sit in the park and target people and we have urged students to be vigilant and to not use their cellphones while walking” says Amler, who says SAPS Hillbrow have not been helpful regarding this issue either. Amler says that it is not logistically possible for Park Mews to offer transport for Wits students coming from campus. Park Mews has also made an arrangement with security at Park Lane Clinic to allow students to use its gates as a short cut to avoid using Queens Road when coming from the Wits Junction bus stop.